This decision and our critique of it created some waves in the small Canadian milieu. A good number of individuals complained at the bookstore's counter. A few members of the bookstore's “collective” had their disagreements as well. And several groups wrote letters criticizing the decision. Among them were those from Le Mortier (an anarchist class struggle publication), La Sociale CDL (distributing notably the “Editions Spartacus” in Quebec), Poing d'Exclamation! (mostly anarchist) and Red & Black Notes (an Ontario councilist publication). 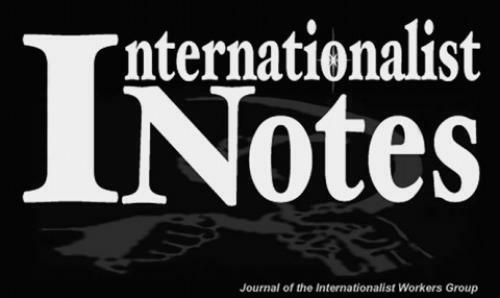 Following this, a bookstore meeting was held where a member of Internationalist Notes was permitted to speak. Our intervention, rather than invoking some right to the freedom of expression, affirmed the censured position's revolutionary class character. This meeting finally revoked the previous censorship motion and decided to put the blacklisted publications back on the shelves. Knowing the history, the practice and the middle class politics of this shop, though, we realize that this new decision could be overturned at any time. So, should the case arise, (which would not surprise us in the least), we invite our readers to subscribe to be sure to obtain our publications and as well as those of the International Bureau for a Revolutionary Party. (1) Librairie Alternative Bookshop, 2035 St-Laurent, Montreal. World March of Women - Reform or revolution?